I love getting to introduce today's house guest. Not only because she knows a thing or two about design (don't miss her house tour for all of the evidence), but also because she's sic talented in ways even she didn't know! Some of you may recall my mention awhile back about that day she decided to pick up a paint brush and make MAGIC for the first time since high school . . . Total. Ridiculousness. Thanks for stopping by to share your stellar tips today, Kimberly! I'm so excited to be a part of Tobe's House Guest Series! I've admired her and her blog for such a long time - she's got an amazing sense of style and I'm so so excited to be welcomed into her very awesome space!! Can I use anymore exclamation points?!! Sorry, I'm excited!!! Ok, I'm calm. I am. And breathe. A little about me... My boyfriend and I bought our Edwardian semi in Manchester, England nearly 3 years ago and have been working on it with our own two hands ever since, blogging about every success and every failure at www.swoonworthy.co.uk. 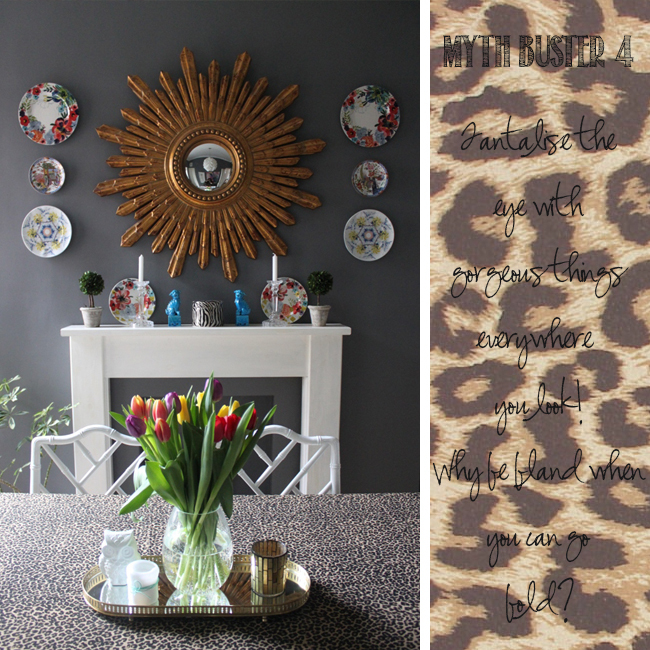 My own style is a mix of eclectic, boho and glam (Is it any wonder I love Tobe's style?). However, like many of us out there, we don't have loads of cash to splash around and yet, we want big style. It's hard to find fantastic products when the selection here in the UK is pretty sparse. The room sizes are decent for England but homes are generally much smaller here than in America or Australia. With such challenges, I've learned that many of the rules I read when I first started my decorating adventure are meant to be broken - with creativity and a bit of attitude, I've discovered anything is possible. 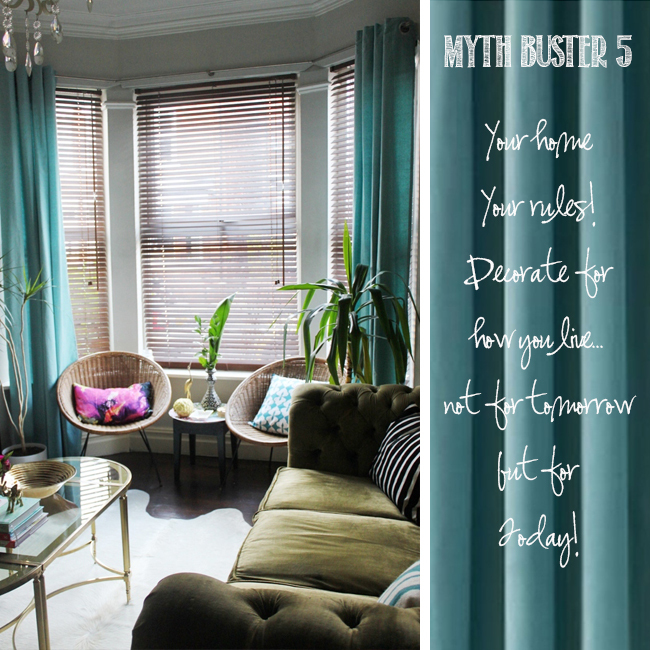 5 Myths of Decorating Debunked! Myth #1. It takes a big budget to get big style. Hell, this is the easy way out! Who wants to just BUY when you can 'make do and mend'? Get creative with paint, wallpaper, fabric and vintage items. Your home will be more creative and more eclectic to boot. Not only that, but you'll end up with pieces that are unique and uniquely you. See that little chest of drawers? It was a horrible ugly painted pine dresser with silver knobs that was ready to go to the charity shop. Left over wallpaper and paint and some new handles gave it a new lease on life. Total cost? £24. Myth #2. Rooms should be decorated in light colours to make the space appear larger. Since painting my bedroom black, it's not only made accessories and furniture pop, it's given us the best 'cave' for a brilliant night's sleep. Win win. 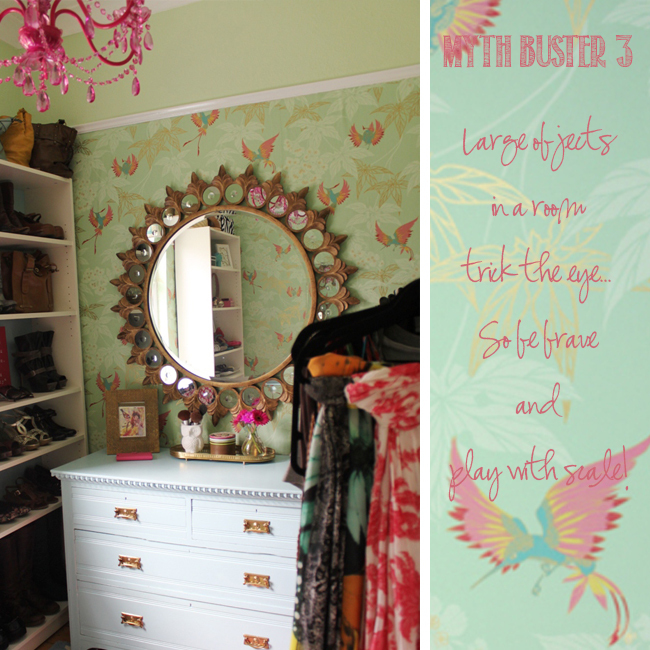 Myth #3. Small rooms should always have furniture and accessories that are small or scaled to fit the space. Using big art, a large light fixture, a big mirror or a single oversized object in a room fools the eye into thinking that a room is bigger than it actually is. It's a great trick to play with scale and interior designers use it all the time. Follow their example. My dressing room is a tiny box room. Using a huge mirror and a big obnoxious pink chandelier was never a question. How boring would the room be with a tiny mirror and tiny pendant? Bigger is definitely better! Myth #4. Every room should have one focal point. Why stop at just one? You want to be tantalised at every turn - giving your eye something gorgeous to see at every turn gives the room interest and makes you want to linger to take it all in. My dining room has at least four focal points - a large floor to ceiling gallery wall, a mantle, a console vingnette and a barcart with a big art canvas above it. I'm a maximalist at heart so it makes sense to decorate in a way that reflects my passions. Myth #5. Stick to neutrals for maximum resale value. Listen, you are living in your home right now. Not some future imaginary person. Unless you are looking to sell in the next 6 months, decorate for you. You spend so much of your time in your home - why go bland when you could go beautiful? 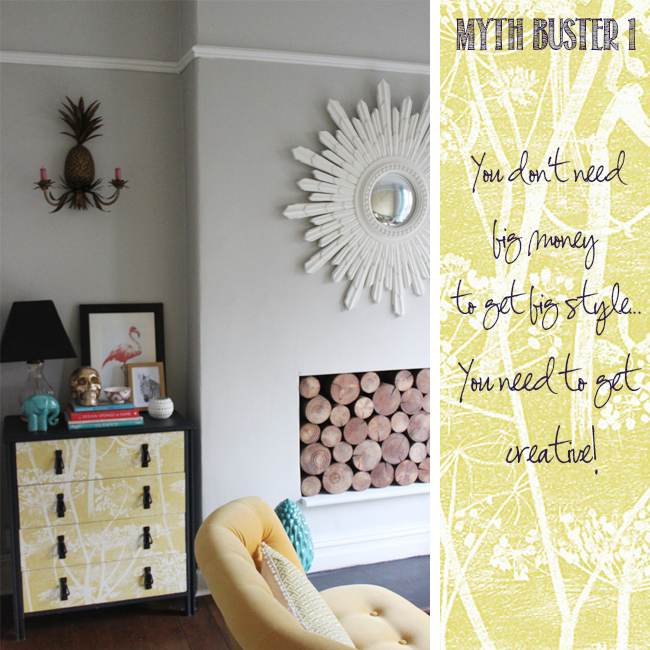 Ok, so not everyone may 'get' my colour combination - saffron yellow wallpaper, pale turquoise curtains, olive green and bright yellow sofas and pops of pink play nicely in my head. But as long as I enjoy it, who cares what other people think? 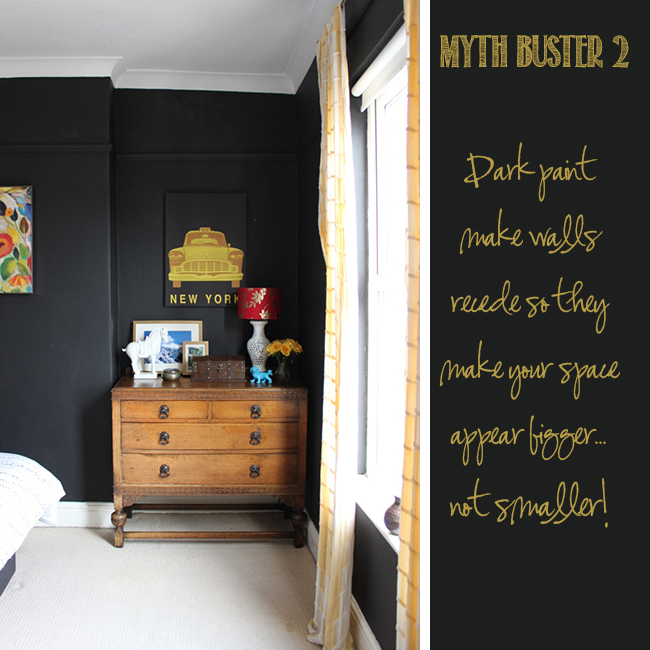 I hope these myths inspire you to take risks and get creative with your space! Have you broken any rules in your home? Really love this post and spelling out the myths with such style! You know I love myself some Kimberly style! I'll just say what I say to her most of the time - amen sister! Fab post! I need her to come help me decorate my place! so pretty! love all the tips as my husband and I just moved into a new very small apartment :) thanks! Great design tips. It's taken me awhile to decorate my home for myself and not for some imaginary (and very bland) future owner. And I absolutely love Kimberly's style! I loved reading this post! Everything was said beautifully and I couldn't agree more with all the tips. Thanks for the introduction to Kimberly's blog too. £24 for that chest of drawers? Kimberley, your talent knows no bounds. Have I told you how much I love your home? Well I do. TONS! LOVE it Kimberly - your home is gorgeous. Great post! Her home is straight amazingness. I love every single detail and wish I could just take her dressing room and transplant it to my house! I'm a big Kimberly fan. Her tips are great, and I love the way she illustrated them using spaces from her own home. The one I struggle with the most is not decorating for resale. There are things I would do if I didn't think we're going to be moving in 2 years. I just don't know if I feel like neutralizing them when the time comes. Well, maybe it's my conservative hubby that needs convincing it's okay to live for today!